The future is bright for the paper industry – 39% of forest, paper and packaging CEOs are very confident of revenue growth over the next 12 months. In the midterm, that confidence increases further with 50% of CEOs expecting growth over the next three years. To deliver on this optimism, however, will involve increasing the productivity of materials handling in the paper industry is improved. And that means deploying more efficient manufacturing techniques. Assessing warehouse operations on a regular basis is critical in such a competitive marketplace. Auditing facility processes and how existing technology is being used will help your enterprise edge ahead of its rivals. Once you have an end-to-end understanding of the flow of goods and materials, you can start introducing warehouse innovations such as applying cross-docking to maximise space and more efficient weighing systems (if they’re not already in place). Connect physical devices digitally across all warehouse operations using the ‘Internet of Things’, which offers game-changing capacity gains for materials handling in the paper industry. The Internet of Things allows managers to monitor every aspect of warehouse operations in real time, from conveyors to dock equipment and even air conditioning systems. Such visibility and transparency offers huge potential for workflow optimisation and efficiency gains by identifying bottlenecks, cutting down on waste and predicting supply chain needs in advance to reduce delays and downtime. At the heart of any successful Internet of Things strategy is the data driving it. For example, data analytics is already being used to transform how forklift truck fleets are managed. Using fleet management software, managers are tracking impact events – and their most frequent locations – to identify bad operator practice and implement measures that drive down their occurrences. This is leading to efficiency gains for managers while critically, driving up safety standards in the process. The potential of self-driving vehicles to transform operations is already making a positive impact, with autonomous forklift trucks being rolled out across warehouse operations. The technology offers a host of efficiency benefits over traditional operator-driven lift trucks – from reducing idle times by 40-50% to zero to making energy savings of 30%. As analytics, automation and big data are deployed to aid in materials handling in the paper industry, how information itself is viewed is changing. Sitting at a desk, viewing data remotely on a desktop, isn’t good enough. Instead, mobile technologies such as phones and tablets are taking centre stage, allowing managers to access KPI-rich dashboards wherever they are and monitor performance and equipment status in real time. This means crucial management decisions can now made in a matter of hours, not days. 45% of maintenance personnel state that ‘equipment age’ is the leading cause of unscheduled downtime – with the average cost of an hour of downtime at a paper and pulp mill estimated to be over $20,000 (£15,000). It’s essential to explore all options available for replacing aging equipment to achieve more efficient materials handling. 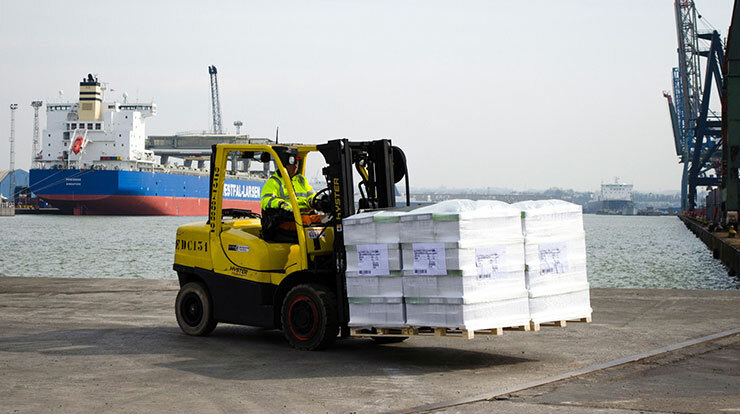 The latest innovations in forklift truck technology have extended the range of productivity-boosting abilities to ensure that capacity rates have room to grow in the future. By implementing new technologies and processes to boost efficient materials handling in the paper industry, the sector can put itself in the best possible position to enjoy revenue growth in the years ahead. For those who fail to act or treat change as a threat instead of an opportunity, they risk being left behind by fast-moving, progressive competitors who are prepared to exploit leading edge processes and technology. Audit your existing workflows and processes regularly to ensure your warehouse operations remain optimised. Deploy automated vehicles and other technologies to drive up efficiency rates both on the warehouse floor and in the boardroom to help boost capacity. Don’t be put off by seemingly nebulous terms like ‘Internet of Things’ – take the hype away and the innovations they introduce could be game-changing for your operations. Consign aging technology to the recycling centre and instead, buy or rent new equipment that offers a wider range of efficiency-focused capabilities. Find out more about the latest solutions that can optimise your warehouse for just-in-time operations. Download: “Material-Handling Operations that Shift the Gear in the Paper Industry: Just-In-Time”. This entry was posted in Big Trucks. Bookmark the permalink.